Last Thursday my season finally came to an end, starting in Shrewsbury for a friendly against Galatasaray and ending in Salzburg for the playoff final in the third tier of Austrian football. Along the way I saw the champions of England, Germany, Holland and Serbia, as well as non-league matches attended by less than a hundred people. It was without question the best season of my life, and one that I will remember forever. To be honest I barely attended a bad game all season (the 0 – 0 draw between two Serbian third division clubs in front of 40 people being a rare exception), but for those people interested in the best moments of all, I decided to put together a top ten of my favourites this season. As with all ‘top ten’ lists I post on my website, please remember this purely applies to matches I saw live. If your club isn’t on the list, I probably just didn’t watch them this time around! Without further ado and in reverse order in true Top of the Pops fashion, here are the ten moments I will remember most fondly from 2013/14. If you want to read the full report from a particular game, click the title to visit the article I produced at the time. 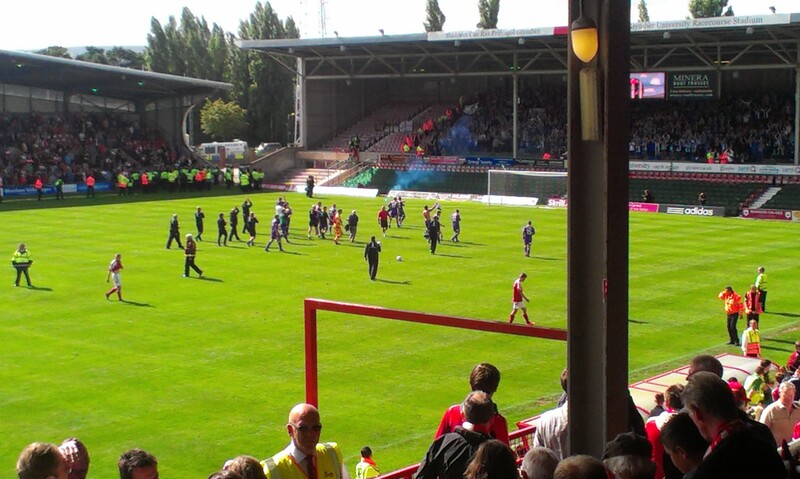 Wrexham vs. Chester is a massively underrated derby in Britain, with a level of hatred right up there with any other fixture you can imagine. To add to the intensity of this game further still, the sides had not met for several years due to Chester’s financial problems which had caused them to start again as a fan owned club. Wrexham were big favourites for the game, having pushed for promotion in the last couple of seasons and being one of the sides expected to challenge at the top of the table. Meanwhile, Chester had not won a game or even managed a draw in their opening five fixtures at Conference level. The atmosphere and ill feeling went up another couple of notches when a small group of Wrexham fans produced a banner referring to the death of two Chester fans. Chester took an unexpected early lead which created great joy in the away end, but it was the second goal which really sent the visitors absolutely wild. Perhaps it was the fact they had struggled so much and lost so many games that they didn’t want to believe they could actually come to Wrexham and win after the opening goal, but when the second went in after 17 minutes it was as if they could finally put all the years of torment behind them. There was true carnage in the away end, with blue pyro being set off and bodies flying over seats as far as the eye could see. They went on to win the game 2 – 0 and sang in the away end for an hour after the game, but every time I hear somebody say that fan ownership can’t work, I think of the two minutes of madness following that second goal. 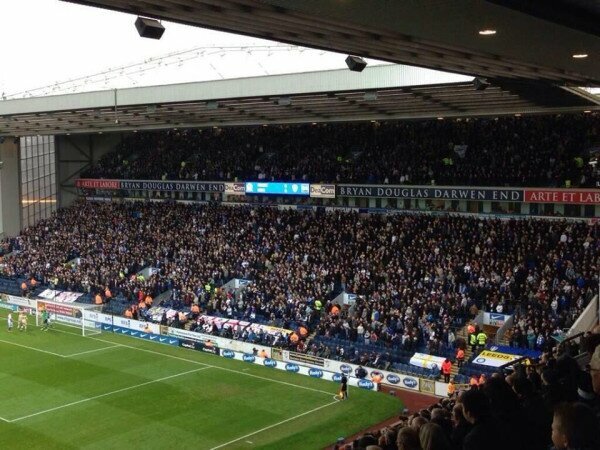 It says a lot about how good Leeds United’s away support is when one of my favourite memories of the season took place in a pub two hours before the game even started. Fresh from singing about a team of 100 Michael Browns and encouraging large intoxicated men to dance on the tables, the visiting supporters from Yorkshire counted down from ten before pretending they had scored a goal, going absolutely mental as the count reached zero. Tables were overturned, pints ended up on heads and people hit the ground in the resulting carnage. They lost the match 1 – 0 with the team playing as though it was them who had had ten pints before kickoff, but (thankfully) Leeds United supporters have learned how to have a good time without relying on the minor inconvenience of the team actually being any good at football. I knew this was going to be good. Everybody told me that this clash of two amateur Dutch sides would be one of the most memorable fixtures I ever saw, and I was genuinely excited for the game. But it is impossible to understand the Spakenburg derby until you experience it for yourself. Whatever you read about it, and whatever people tell you, nothing can compare you for the civil war which descends on this quiet fishing village. Until around 15 minutes before the game, everything was pretty standard. The atmosphere was considerably better than the average non-league game, but there was nothing in particular which would make your jaw drop. 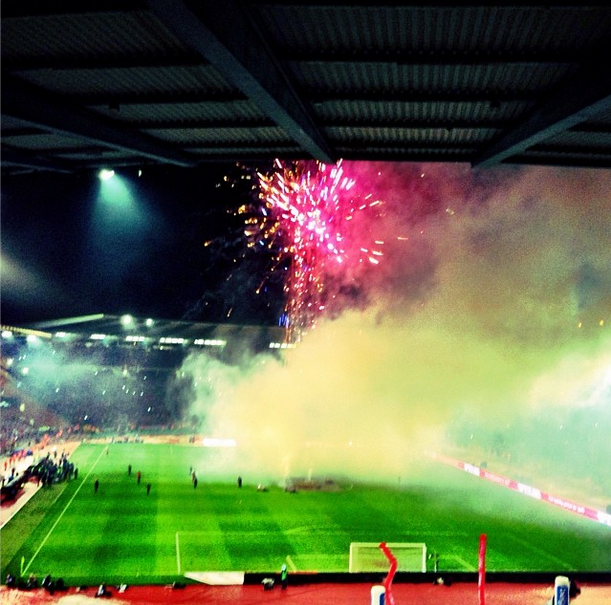 That was all about to change, with a simply spectacular pyro show and an even better tifo display. Now, I have seen some things at football grounds, but I had never seen a bunch of smurfs brandishing swords on a flag the size of a stand. Until now. From that moment on, the most unusual derby in the world was complete madness, but it all began with a never-ending supply of blue smoke and a gang of angry smurfs. This was a goal which meant nothing, yet somehow meant everything. Belgium had already qualified for the World Cup, and Wales had already been eliminated several games ago. The travelling Welsh fans had been preparing for a heavy defeat, but instead they were rewarded with an inspired performance. It was the first time since the death of Gary Speed that we had actually looked like a side capable of competing with a team that wasn’t Scotland, and the first time I had been able to enjoy a Wales match without thinking of the tragic loss that we suffered as a nation when we lost our leader. Still, it looked as though the tremendous effort on and off of the pitch was going to go without reward, with the hosts leading 1 – 0. Craig Bellamy was going to retire from international football after the game, and the great friend of Gary Speed still had one last tribute to his friend before the final whistle blew. He found Aaron Ramsey with a superb pass, before Arsenal’s midfield genius was able to turn the ball into the back of the net with just a few minutes remaining. The away end went absolutely bonkers, celebrating as if we had just beaten England 5 – 4 in the World Cup final, rather than finished 5th out of 6th in our qualification group. The party went on for some time after the final whistle, with the Belgian rave music being played to celebrate their passage to Brazil turning into a the backing track to the Welsh football party going on in the highest corner of the stadium. The away supporters completely lost their heads for the next 30 minutes, dancing about in ways that grown men simply shouldn’t do. Somebody was doing the robot while wearing only a pair of pink underpants, and general chaos reigned. If we ever do anything other than fail miserably, watch out for one of the biggest parties you’ve ever seen. This was another fixture that I did not give enough respect and attention until I actually attended it in person. Make no mistake, the hatred and intensity when these two collide is very real indeed. There were a couple of memorable moments in this one, especially the celebrations following the first goal, and the Newcastle players recreating the famous Di Canio knee slide when they equalised. Just when it looked as though the game would end in an anti-climatic draw, Fabio Borini decided he had other ideas. Collecting the ball just outside of the area, his unstoppable strike left the keeper no chance and threatened to rip a hole in the net. Not that anybody cared where the ball was at this point, with the stadium celebrating as though the Queen had just announced Kevin Keegan and Alan Shearer were getting deported to Outer Mongolia. My friend who had got me a ticket was nowhere to be seen, the last glimpse I got of him being his head poking out of a mosh pit about four rows in front. I was getting kissed by more random strangers than a drunk girl in a nightclub in Magaluf and accidentally demolished my seat when somebody decided to go crowd-surfing and almost landed on my head. I was finding bruises in new and unusual places for days after the game, and left with many new friends and a lifelong admiration for this derby. I have been invited in the Sunderland end at St James Park next season, and while they surely can’t win 3 – 0 again it’s sure to be another memorable day. If you are planning a trip to experience what English football culture is really like, this derby should be the first stop on your list. If Feyenoord had gone on to win after taking the lead, this would surely have been at number one spot. Unfortunately Ajax came back to win the game 2 – 1, but for a few moments De Kuip was reduced into absolute mayhem as Graziano Pelle put the Rotterdam side ahead. His powerful header was nothing compared to the power of the celebrations, where I ended up about 15 rows away from where I started hugging a man I had never met while his girlfriend could only look on with envy. I have never experienced a louder and wilder goal celebration, and while the day ended in disappointment, I still think back to this goal and smile on a regular basis. 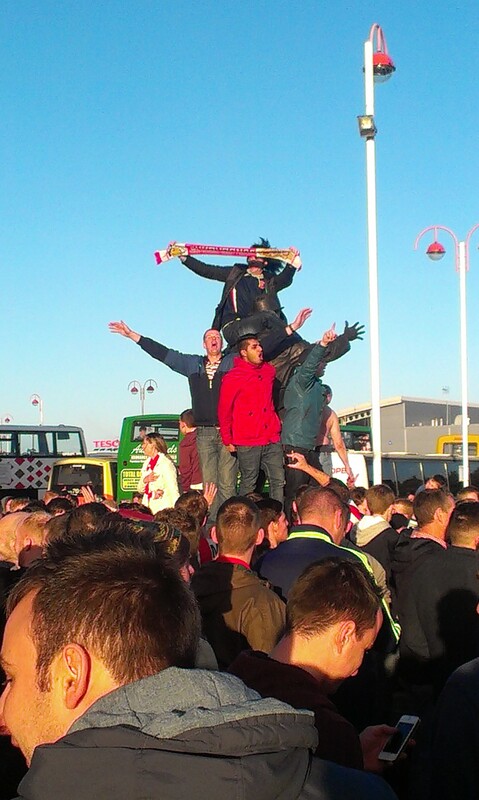 I will of course be at this game again next season, and will hopefully be able to witness the boys from Rotterdam go one better and take all three points. This was another game with plenty of memorable moments, with an honourable mention going to the Lech tifo during the game which seemed to set the entire away end on fire. However as I can only choose one part of the game to include in this list, it simply has to be the stunning display from the Legia fans before the game to celebrate the fact that they had secured the title the week before. 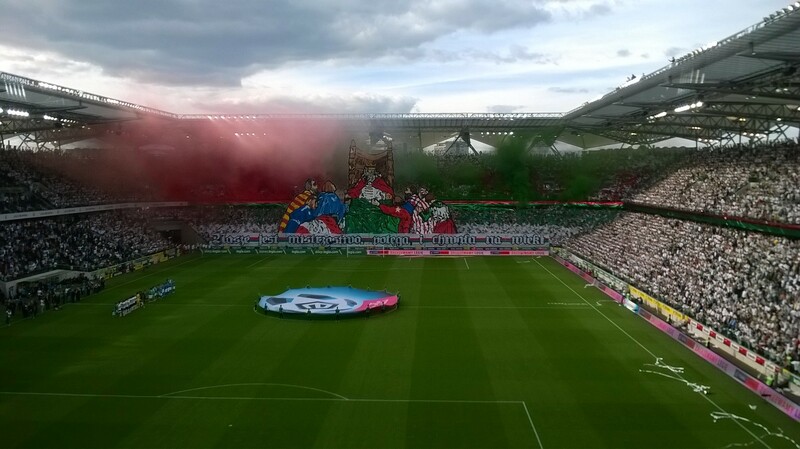 A gigantic banner was unfurled from the roof of the stadium, covering the entire stand with an image of a king dressed in the colours of Legia, with subjects bowing down to him in the colours of their rivals. Moments later, the entire pitch would be obscured by red and green smoke as the display was completed, delaying kick off by at least 10 minutes as the supporters linked arms, bounced up and down and saluted the champions. It was a privilege to be part of, and has inspired me to return to Poland far more often in future. Having just gone 3 – 0 down (5 – 2 on aggregate) in the play-off final they had worked so hard to reach moments before, the Austria Salzburg supporters showed just how special they are. Rather than grumbling, leaving early or turning their frustrations on the team, they raised their scarves high above their heads and serenaded their team with ‘You’ll Never Walk Alone’ non stop for the last thirty minutes of the match. All around me tears of sadness turned to tears of pride, this club has been on a long and difficult journey, but ultimately it has built a bond of love between players and fans that cannot be broken, not by a defeat, not by Red Bull, or anybody else. One day this magical club will return to their rightful place, and when they do there will be a party the likes of which you have never seen. For now, they continue to walk through a storm, with their heads held just as high as ever before. 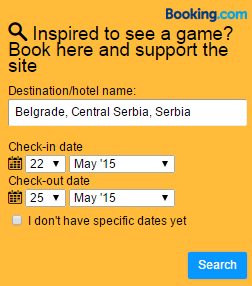 My trip to Serbia not only changed my outlook on football, but genuinely changed my life. This was far more than an incredible 90 minutes, but a day full of experiences that nothing has ever come close to before or since. 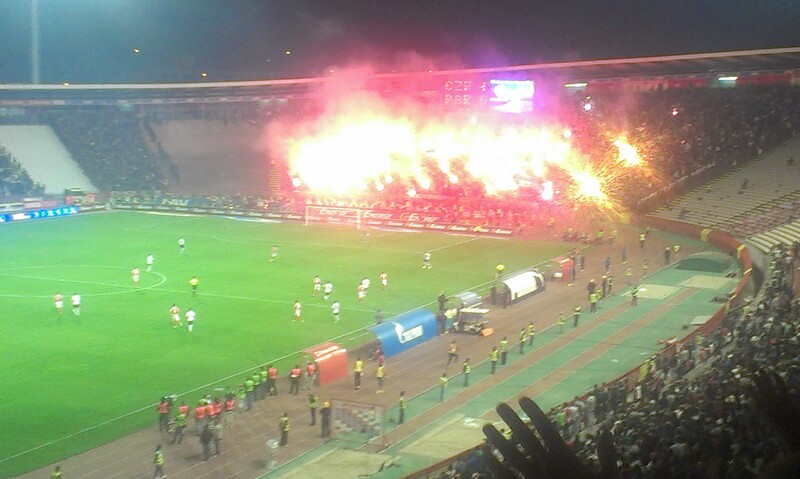 Red Star vs. Partizan is the best derby in Europe, no doubt about it. I haven’t yet ventured into Asia or South America for football (this will change next season), but it may well be the best in the world. The first indication that this was not going to be just another derby came around two hours before kick off, when a plane circled around Marakana at a surprisingly low altitude. 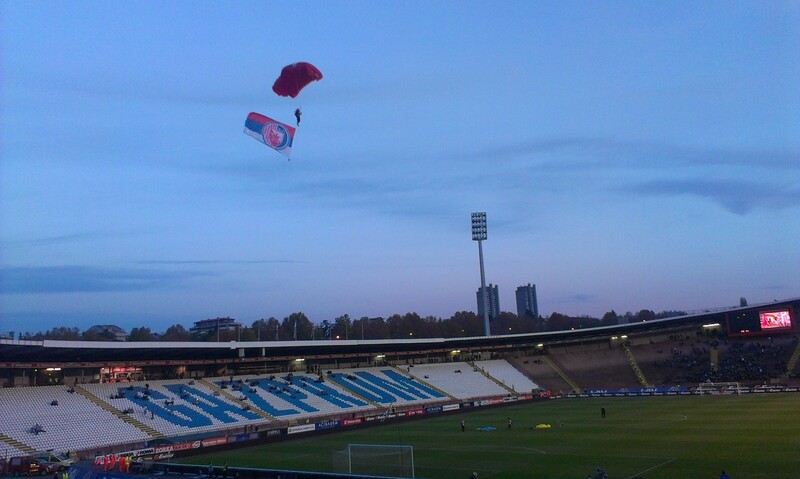 I was confused as to what was going on, until several Red Star fans leapt out of the plane and parachuted into the stadium, flying flags behind them as they did so. They landed on the pitch to a heroes welcome from the home supporters, but angering the visiting Partizan fans into hurling flares and attempting to break onto the pitch. The police stormed onto the field and, rather than extinguishing these flares, simply chucked them back into the away section. This is Serbia, and they do things differently here. It’s only natural to be unhappy when you’re losing a derby match, especially one which will ultimately have a significant say in who wins the title come the end of the season. I’ve seen plenty of plastic seats broken, offensive hand gestures given to Alan Tate and requests for managers to be fired. What I hadn’t seen before was a stadium being set on fire. To begin with it looked like a large pyro show, very impressive but something I had seen plenty of times before in Germany, Italy and Holland to name just a few. But it didn’t stop there. The fire continued to rage long after the flares had burnt out, and it was clear that Marakana was actually alight. I was convinced the game would be abandoned, how couldn’t it be? How naive I was. After taking the players off the field for around 30 seconds to wait for the smoke to clear a little, the game carried on while the stadium blazed away in the background. Eventually the fire brigade arrived, directing powerful hoses in the away end. Still the Partizan supporters were not ready for the fun to end, using their bodies and flags to block the streams of water as best they could. Eventually a small measure of control was restored, but the point had been made. The most shocking thing of all was how normal these all seemed. While I stood open-mouthed in amazement, it barely caused a ripple within the Red Star fans, who simply carried on supporting their team as normal. Like I said, they do things differently here. Posted on June 11, 2014, in General. Bookmark the permalink. 6 Comments. I wonder Ben, what is your opinion on the twitter football journalists that run accounts like “Genius football.” The ones that post links to various sites on “The top ten rivalries in football” and fail to mention the likes of Legia Warsaw vs Lech Poznan (which I haven’t been to but I read your article and it sounded crazy) or “The top ten best fans in Europe” and include Manchester United, Barca and Real Madrid but don’t mention the likes of Feyenoord or Austria Salzburg. I ask you this as you’re my favourite writer on this topic, probably to do with your compliments for Leeds’ away support. p.s- Thanks for the Leeds mention in this article, glad we impressed you. Some of these accounts are absolutely ridiculous, for example ‘The best derbies in the world’ and they have Man Utd vs. Liverpool at number one! A lot of it is click bait journalist from people who run adverts on their site and just want as many views as possible without good content. For example the Buzzfeed style “You won’t believe who is signing for Chelsea!! !” and it’s them signing a 12 year old for the reserve team. I really hope the trend dies out soon, or people who try to produce things worth reading will be ignored as everyone will be so put off by this dreadful style of journalism. Glad you enjoy my work anyway, you support a very special club! It’s great reading about football culture in other countries, up until about 5 years ago I used to claim I supported a team with the most passionate fans in the world, but however good Leeds fans are compared to most in this country, reading about fans of Dutch, Austrian and Polish clubs makes me embarrassed to have made those claims. Thanks for the reply, I was interested to hear about your opinions on them sorts of people. Have you got any games in your mind already for this season? allows players to fight till death and keep playing till there is a final winner. make your gameplay that much more interesting and engaging.